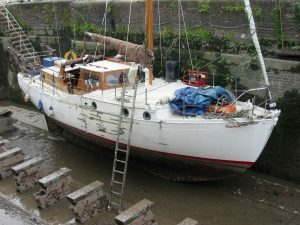 The hull and deck constrution, built by K.R.Skentelbury at Plymouth UK. 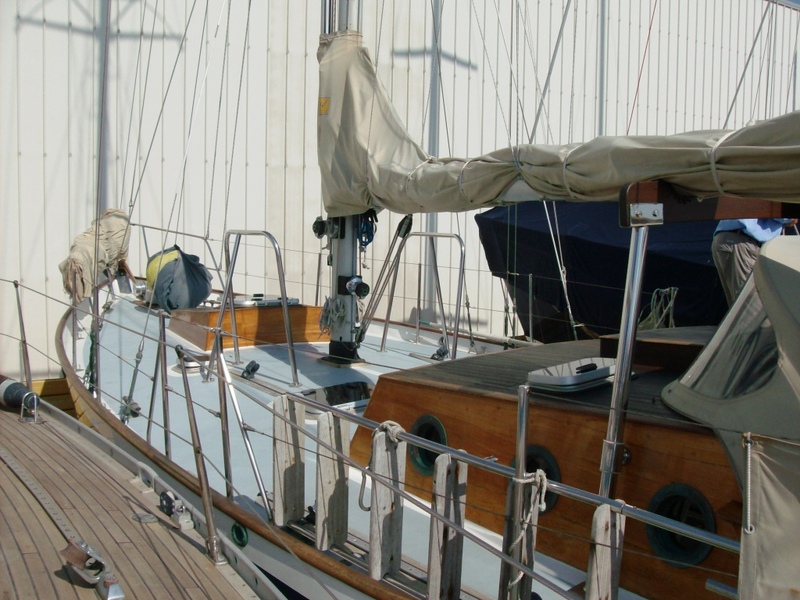 was delivered in 1987 to Mr. and Mrs. David Saxton who fitted out Sagamore over the following five years. 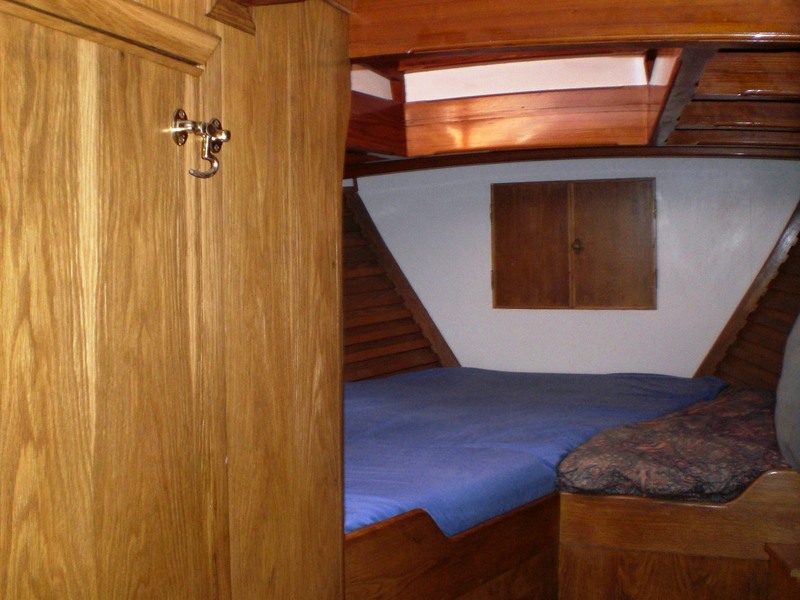 David Saxton is a highly skilled shipwright and the quality of build is excellent throughout. 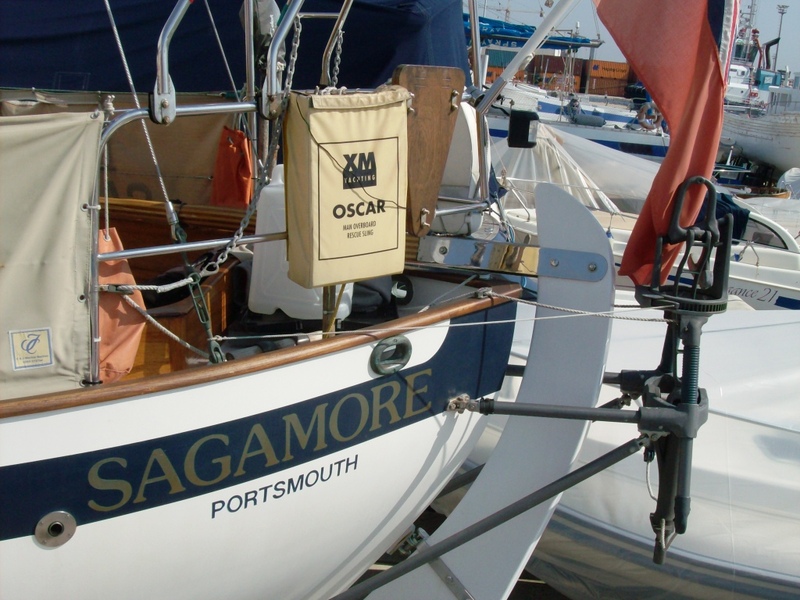 Sagamore was launched in 1991 and sailed to France where the Saxtons were living. The boat until 2006 was berthed at Arzal marina on the river Villain in Brittany and was locally cruised. 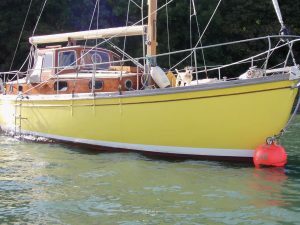 In 2006 when purchased by the present owner she was returned to Falmouth UK. by the owner, his son and friend. While in Cornwall Sagamore was cruised exclusively in Cornish waters during the summer months. In 2009 the owner and his son undertook a successful and enjoyable cruise from Falmouth to Sicily in two stages: Falmouth Gibraltar direct, then Gibraltar directly to Trapani in western Sicily. 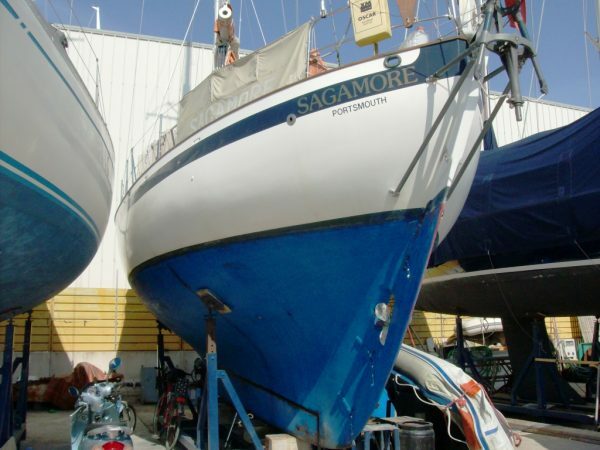 Sagamore has been based in Trapani up to the present day, cruising locally and as far as the Aeolian Islands north west of Staits of Messina. During the winter period Sagamore has been berthed and maintained at the premises of Cantieri Miceli, Via Ilio 12. Trapani, Sicily.. 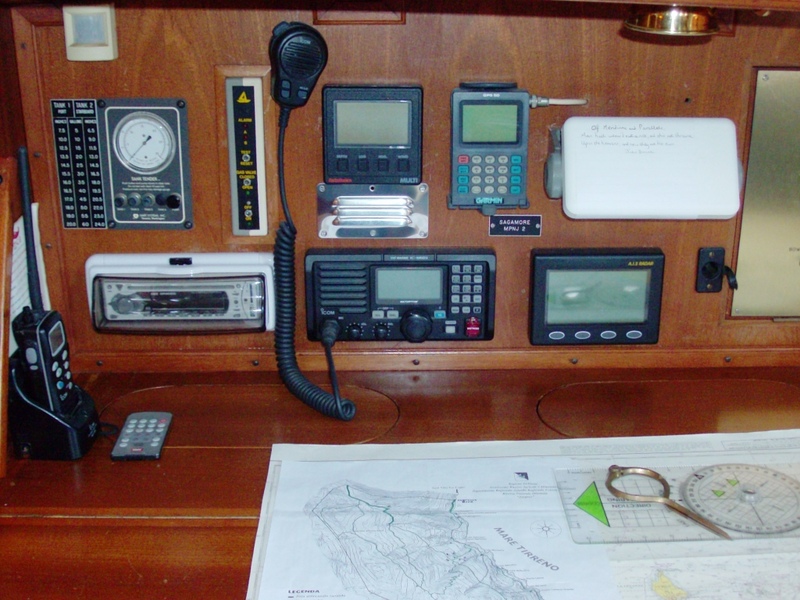 The vessel in in good order throughout, ready for inspection and further cruising. 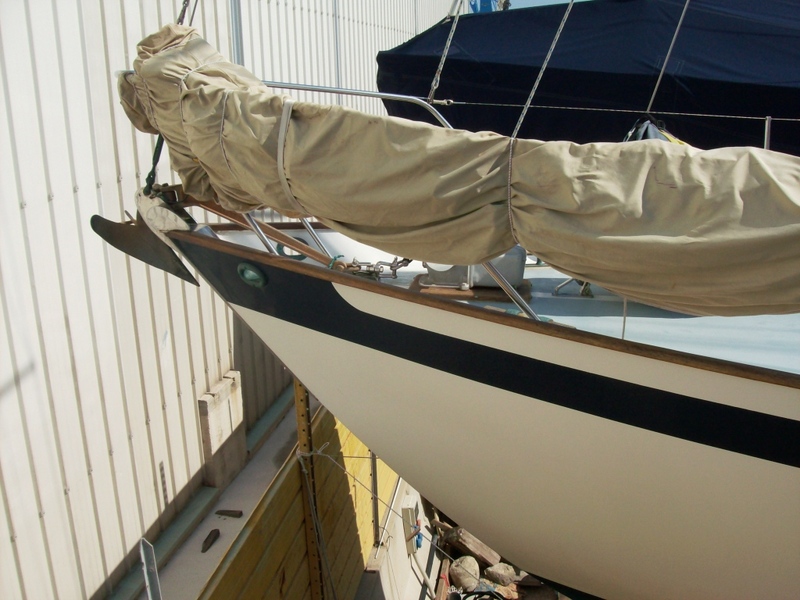 A heavily moulded GRP hull with white gelcoat finish and overpainted navy blue sheer band. Oiled Teak capping rail. Teak trim in cockpit. 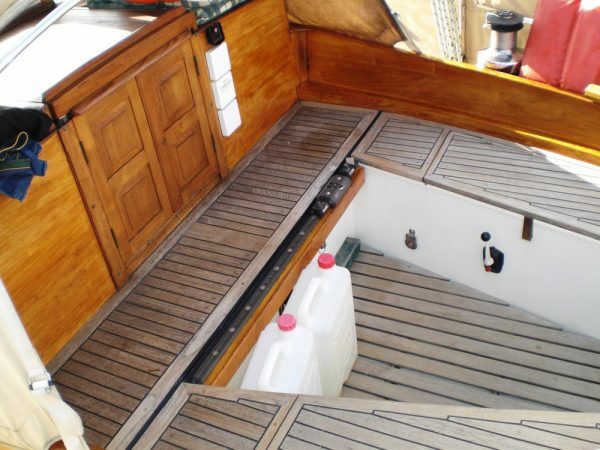 Laid teak to cockpit seating and bridge deck. 10mm teak facing over marine ply construction to main and forward doghouses with laid teak on top. The main doghouse (galley) with 9 port holes in bronze. 3 fixed and 6 opening. 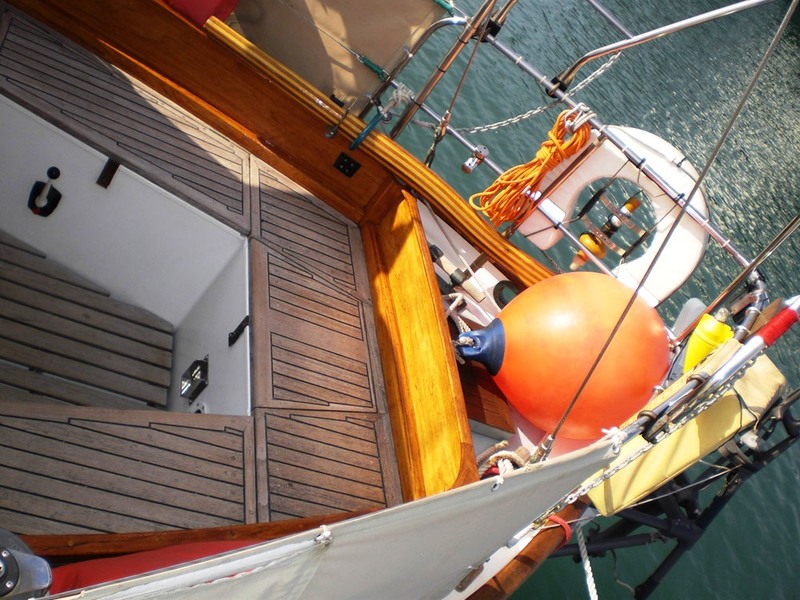 The forward doghouse with one opening (reversible) deck hatch plus additional Gebo deck hatches over the saloon. Marine plywood deck being epoxy coated to the underside before painting. Epoxy resin and “”E”” cloth sheathing externally being finished with a light grey anti slip deck paint. 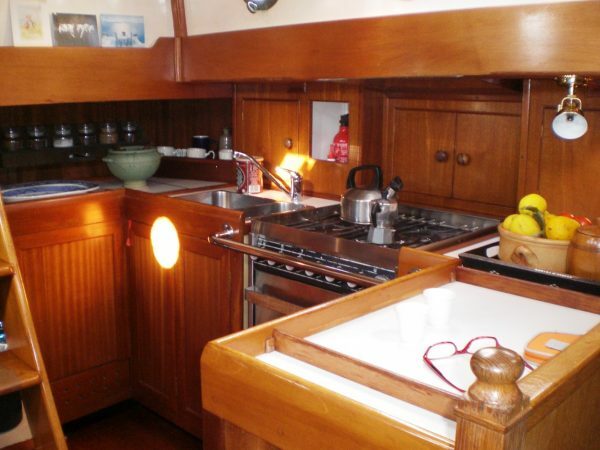 The interior is Oak in the forward cabin and main saloon with Mahogany joinery in the galley and navigation area. 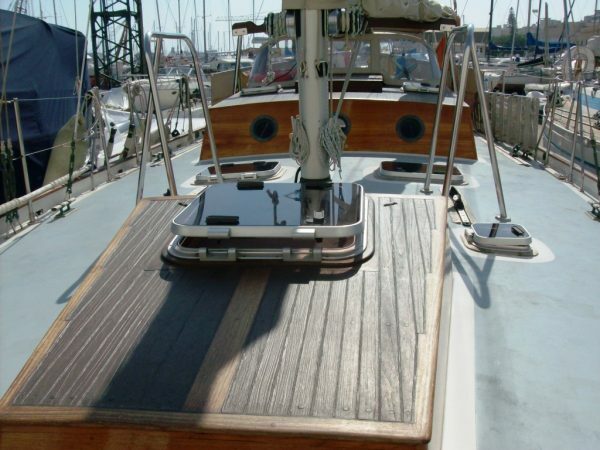 The sole boards throughout are of marine ply overlaid with 10mm thickness Teak. Before fitting out the interior, the hull was lined from the beam shelf to the waterline with 10mm Insulsheet, a closed cell rubber sheet material, with half hour fire resistant rating and 5% max moisture absorption. This has proven to prevent any condensation even in extreme cold. The underwater hull was treated with four coats of Blakes solvent free epoxy before launching. Stainless steel pulpit, 30 inch high stanchions and double guardwires with two gates. S. steel pushpit Stainless steel mast support rails. 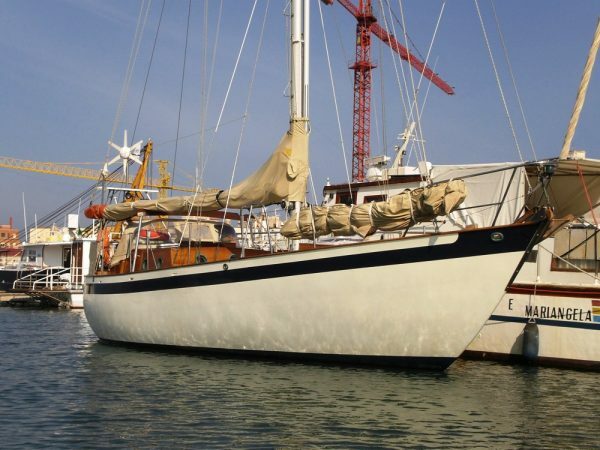 Deck stepped silver anodised mast by John Powell, equipped with mast steps and rigged with 8mm Dyform wire and Norseman terminals, booming-out spar stowed at mast and main boom with slab reefing. 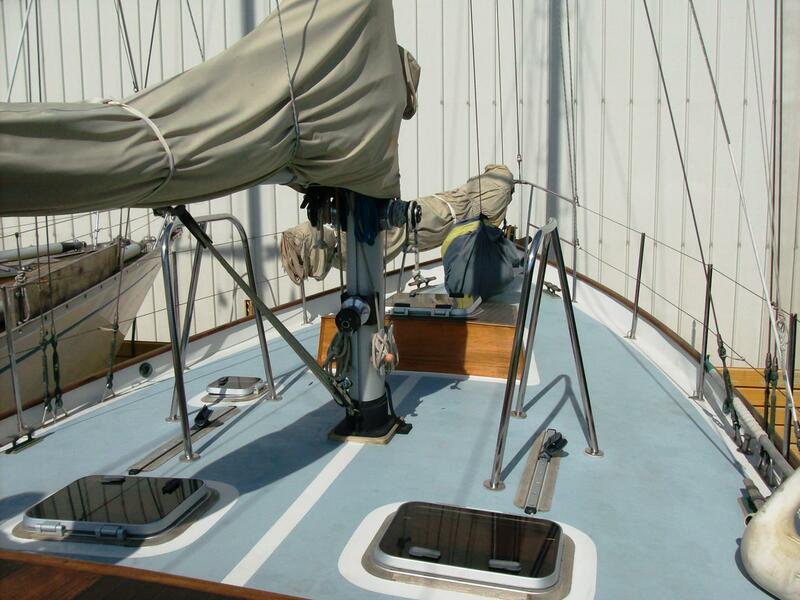 Two Lewmar 30 self tailing halliard winches and one single speed S/T winch for reefing. Two 2 speed S/T Lewmar 52 sheet winches. 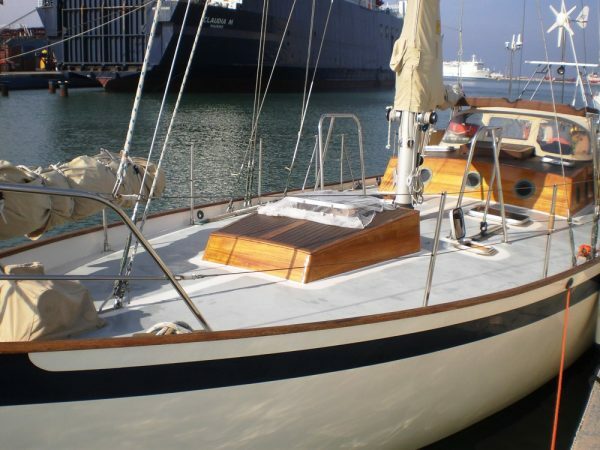 No 2 Yankee 240 sq ft. Staysail 125 sq ft. All headsails hanked. Perkins 4.108 4 cylinder diesel engine fitted with Hurth gearbox and three bladed propeller. Fuel: Steel tank, glass fibre sheathed from new 100 gallons installed behind engine under cockpit sole. 60 litre plastic auxiliary tank. Fresh water: 2X75 gallon stainless steel tanks under galley sole. Plus 14 gallon hot water tank heated by engine calorifer or 240 volt emersion. Forward chain locker with access by two doors in forward cabin. 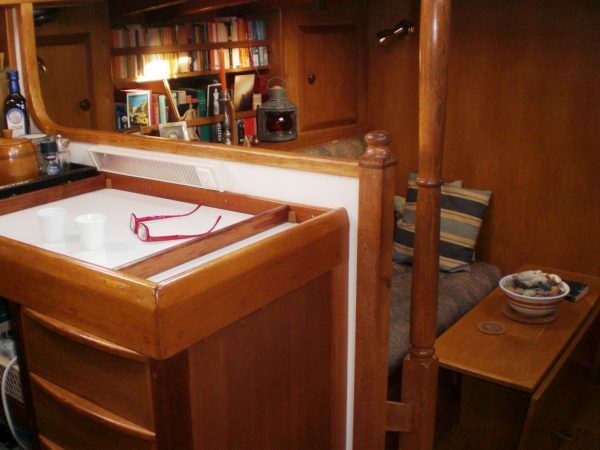 Forward cabin with large double berth offset to port with long term stowage beneath. Toilet compartment aft to port with Lavac toilet, hand basin, shower and large heated cupboard behind the loo with further stowage under the hand basin. Shower and basin drain to grey water tank with electric pump. 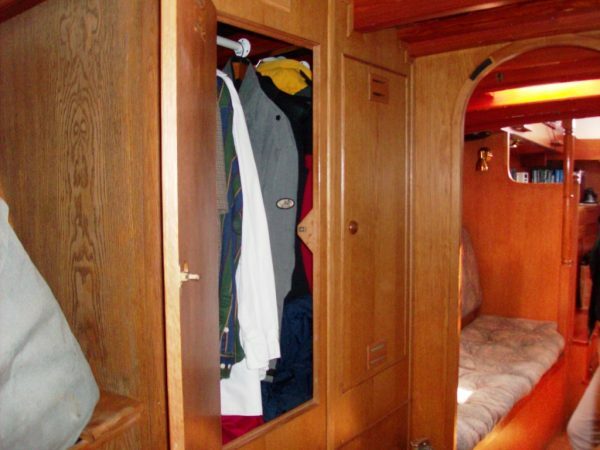 Opposite to starboard, a large hanging locker / wardrobe. 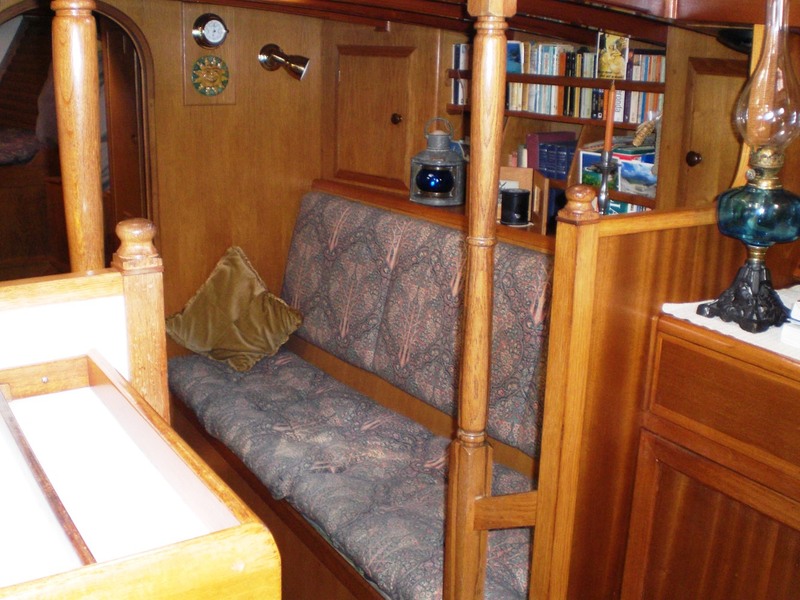 Bulkhead aft with doorway to saloon with L shaped berth/seat to port and berth /seating to starboard, both in excess of 6 foot long. Storage spaces under and behind book shelves and cupboards above. Some stowage under saloon sole. 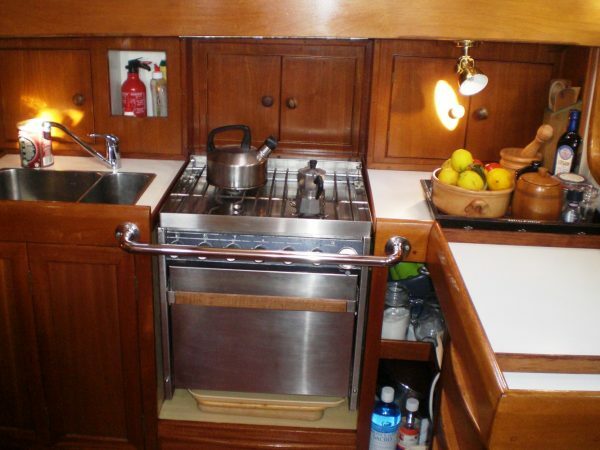 Galley, aft to port, up two steps from saloon, equipped with water cooled fridge. Force 10 stainless steel cooker with 4 burners, oven and grill. 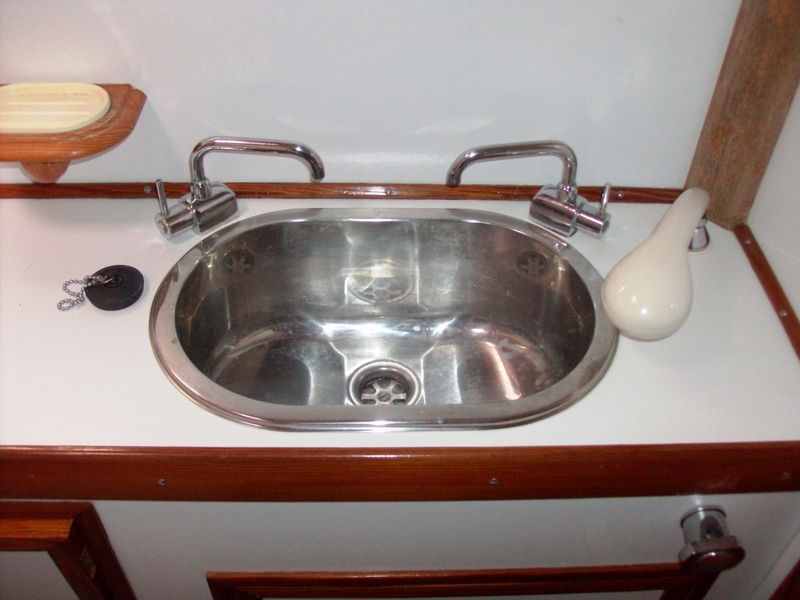 Twin s/steel sink. work tops and stowage. Navigation area opposite to starboard running the full length aft. 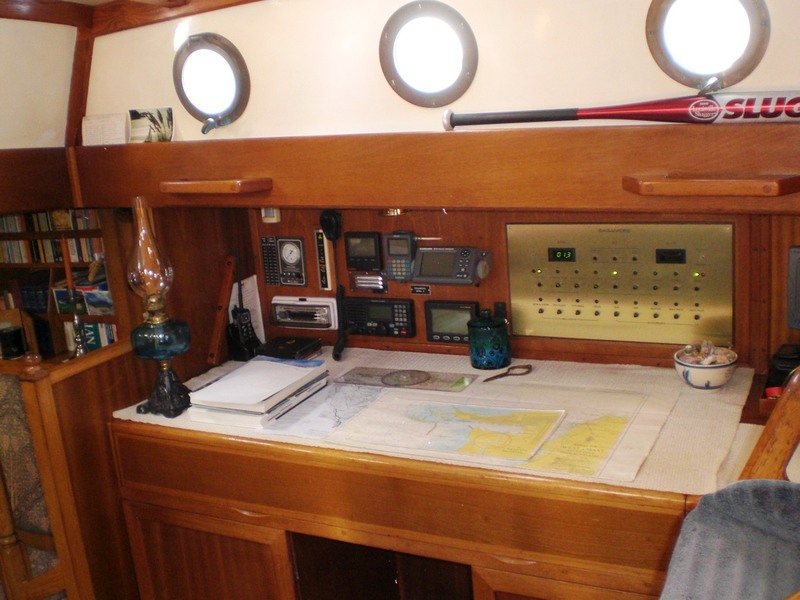 The large chart table holding full size admiralty charts book case, and with two chart drawers capable of holding 500 charts. Companionway to cockpit with cockpit locker stowages. 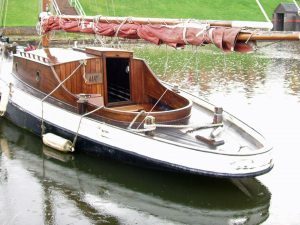 Tiller steering with massively re-inforced stainless tiller / rudder fitting. Electric anchor winch with 45lb CQR anchor and 200ft of 3/8th inch chain. Plus Bruce and Fisherman anchors. Ocean Aries wind vane self steering. Canvas work include: Spray hood with opening front window, bimini which is zipped onto sprayhood and fastened back to stays – Yankee cover, all in beige acrylic material. Tank Tender gauge for water and fuel. 5 x 4.5 kilo gas bottles carried in gas tight locker aft of cockpit. Honda Ex 500 portable petrol generator. Autohelm Sea Talk 50 with wind speed / direction / depth / log / compass all repeated in cockpit. switch panel displays, digital volt and amp meters, ETA circuit breakers, running lights for both fridge and water pump . 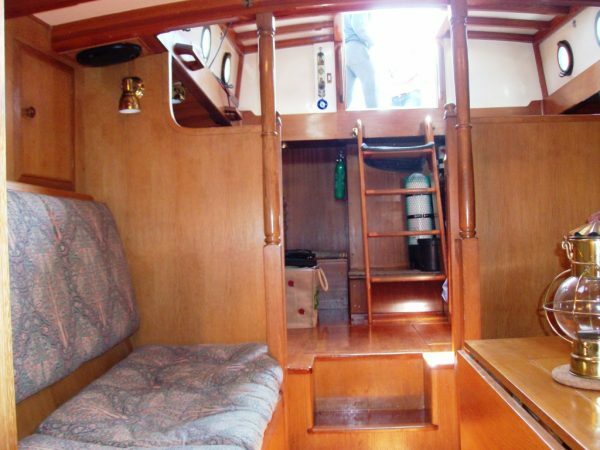 Webasto hot air heating with outlets in forward cabin, heads and saloon. Full inventory of spares, miscellaneous equipment available on request.